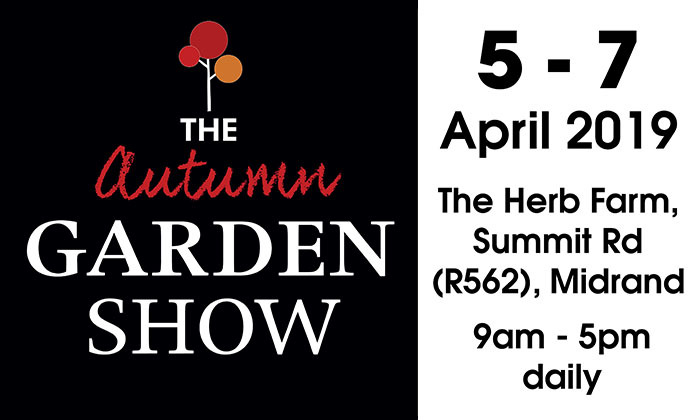 The Autumn Garden Show 2019 – Midrand Gauteng, from Friday 5 April to Sunday 7 April. Visit The Autumn Garden Show, at The Herb Farm, Midrand and enjoy a Herb Tour through the spiral labyrinth garden, listen to free talks and demos from industry specialists, explore shopping avenues filled with plants, crafts and gardening goodies and stop for a spot of lunch a botanical gin or a cup of tea in an enchanting setting. Bring the kids along for a fun-filled day where they can play on jungle gyms and enjoy a pony ride through the garden. The Autumn Garden Show 2019 – Midrand Gauteng. The team from The Gardener and Die Tuinier Magazines present South Africa’s top gardening shows: The Witness Garden Show in Pietermaritzburg and The Autumn Garden Show in Johannesburg. This family event is the perfect way to Fall into Autumn! There are gravel, lawn and concrete pathways around the gardens which are not wheelchair friendly We apologise for any inconvenience.